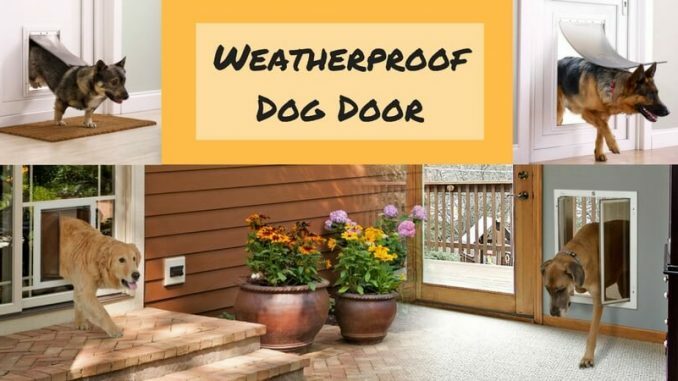 Home » Blog » Reviews » Best Weatherproof Dog Door | Buy Weather Seal Doors Now! When it comes to the dog, we don’t want to take any risk and always wish for the best for him; whether it is about his food, traveling, or the lifestyle. Isn’t it? It also includes all the freedom you give to your doggie, including easy access to come and go from the house. For that, most of us prefer to install weatherproof dog doors. In this article, I am listing down top 7 dog doors which are all weather resistant and long lasting. Read further for the key features and specifications. Insulated dog doors are always high in demand. During the winter season, people don’t want to lose the indoor heat anyhow. Our furry friends are hyperactive and sometimes we can’t control them or stop them to do in and out. At that time, it is preferable to have the weatherproof dog doors to maintain the temperature of the house. Ideal pet dog door comes in four different flap sizes – small, medium, extra large, and super large. So, whether you are having a small little pooch or a giant one, you can surely rely on ideal pet products. This door comes in the classic white color, which can be suitable for any other colors of your house doors. It is made from the structural foam molded plastic. There are 2 soft flaps and they come with the clear vinyl. It can be easily installed and is very durable. It includes the inner telescopic frame. There is an air pocket of up to 3 inches between the flaps. The company gives number one security of your pet and also provides the option of wall kit, which you can buy separately. Anyone who has a pet up to 90 pounds can use this weatherproof door. Also, if you want more than the 3 inches, there is an air pocket up to 9 inches is available. Apart from all these options, there is also one extra benefit. The manufacturer provides a limited lifetime warranty on each of its products. So, don’t get any second thoughts and buy one for your pet today! If you are worried about your cost of energy, and if you have hyperactive pets who just can’t stop their come in and go out activity, then you must have BarksBar dog door. It comes with the two different sizes of medium and large. It comes with the royal white colored plastic and aluminum lining. Your pet does not need to open or close the door everytime he moves inside or outside. The flap sizes of this plastic door are 10.5 to 15 inches. It is soft, sheer white, and includes flexible but heavy-duty Vinyl with a magnetic closure for the comfortable operations. Even extreme temperatures do not affect the Vinyl. There is a two-way locking sliding panel. It also includes the inner telescopic frame. 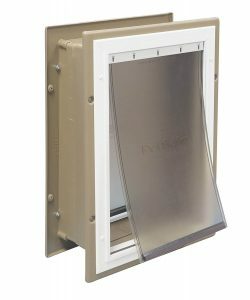 Such weatherproof pet doors are durable enough for daily uses. Even if you have a pet around 100 lbs, there is no need to worry. Also, the plastic used in the making of this dog door is bitten and chew proof. The safety measurements are up to the mark. Apart from the self-locking panel, the door also restricts the access when the door is not being used. It also protects against climates changes, air drafts, and insects. If you don’t want any person to help you in installation, then you can do it all by yourself. It is really very easy and just takes the half hour of your time. Isn’t it a perfect dog door for you? Give your pets the most necessary luxury of all time with the PetSafe sliding glass pet door. Allow them to come and go easily; as many time as they want – without any inconvenience with this beautiful glass doors. This dog door comes in four different sizes – Large, Large-Tall, Medium, and Small. It comes with three color options – Bronze, Satin, and White. If you have a house on a rental basis, such weatherproof doggie doors are the saviors. You can take the door anywhere with you when you move your house and install it again. 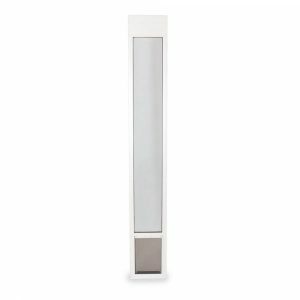 The door is weather resistant as there is a long-lasting aluminum frame, including slide-in closing panel. There are two-panel sizes for the height and four pet door sizes. These measurements are highly suitable for any breed of dogs having the weight up to 40 lbs. 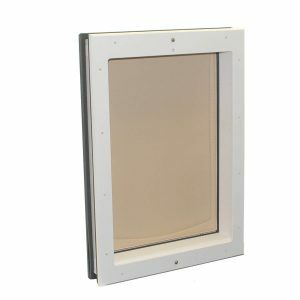 The installation of the glass dog door is easy as you just need to slide the panel into any one corner and install the frame with the stripping given in the kit. You don’t need to cut anything as everything is readily available in the kit. The US-based customer care services are available for the six days a week. So in case you have any type of queries or confusions regarding the products of PetSafe, you can call, chat, or email the experts. As the name suggests, this door is for the large cats and small dog breeds. So, if you have Yorkshire Terriers, Pekingese, Dachshund, or some Miniature Poodles, then this product can be the perfect option for you. Different from most of the other dog doors, Dog Mate small dog doors provide four-way locking. So, you can keep your restless pet safe and secure without worrying about his coming in and going out of the house activities. This door is specially designed for the pets who have the height up to 14 inches. It is preferable to measure the height of the pet before buying the dog door so that you can provide him convenience. It comes with the self-lining up to 2 inches (i.e.) 50 mm. 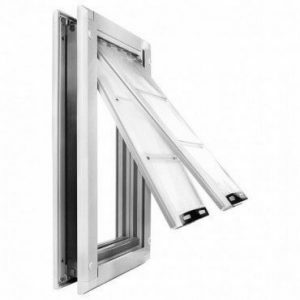 It is perfect for all door types and thin panels. The given flap is entirely weatherproof, brush sealed, and fully draft, which can prevent the cold air winds. It is durable to cope up with any climatic changes and also prevents unwanted bugs or insects from entering the house. There is a manual, which includes the overall instructions regarding the installation and the safety. The secure locking mechanism can provide 100% control of the dog’s movements. The functionality of this weatherproof dog door is just out of the words. Do not have second thoughts and try one. If you want to re-verify, you can read other reviews of the customers and order one for your house today! PetSafe opts convenience for you and your pet. Generally, we prefer to install a pet door on some people’s door. But, this product designed differently. Apart from the people door and not only on the interior wall but also on the exterior wall, PetSafe dog door just looks amazing. It comes in three different sizes – Small, Medium, and Large. So, any breed of any pets who have the size up to 100 lb. can move comfortably from this door. The material used in the making of such weatherproof doggie doors is a durable plastic with the telescopic tunnel. The long-lasting double flap design protects the house from the outer climate. The aluminum frame helps in keeping the outer weather away from home. You can install this door anywhere like all types of slidings, stucco, or bricks. Isn’t it a great feature? Moreover, you don’t need a specialist for the installation. You can do it yourself. It includes the slide-in closing panel for extra insulation and better pet control facilities. It also keeps the strays away from entering in your house. PetSafe is popular as an industry-leading US manufacturer of pet behavior, containment and lifestyle products since 1991. You should definitely go for any one of the pet care product just to decide whether it is fulfilling your needs and wants or not! Endura Flap Dog Doors can become your one-time investment if you have more than one pets of all the different sizes. It comes with the four different sizes – small, medium, extra large, and large; with the three different colors of Bronze, Tan, and White. So, you can choose anyone from these many options to suit your home decor. There are two options of flaps available for this product – single flap and double flap. These versions work amazingly well for the maximum weather resistant and perfect for energy efficiency. The design of this door is safe and supremely comfortable for your pets. It is flexible, long-lasting, and entirely insulated. The flaps come with the adjustable magnet which can help you with your puppy training. It comes with the heavy-duty aluminum framing. 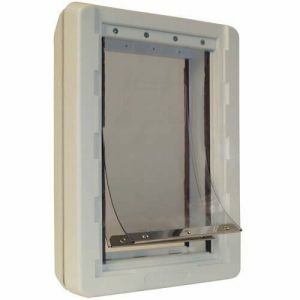 Anyone can easily install such weatherproof pet doors to any of your house doors. It also includes a strong locking system which can close all the access when not being used. So, you just don’t need to worry about any safety issues when you are on vacations. The manufacturer provides superior 10 years of warranty. Not only the other accessories but also the flaps come with the 15 years of warranty. If you get confused about which flap you should go, let me tell you that if you go for the single flap version, it can insulate fine in any weather. And if you select the double flap version, it is the best option for the severely bad weather. This product has the DoubleMag technology, which can give an airtight and weatherproof seal to the dog door. It is certified to give 15 times better performance than the required energy. The insulated flap mechanism can keep your house warm even when the outer weather is chilled with the storm. Not only for cold, but it can work well even when the climate is around 150 Fahrenheit. 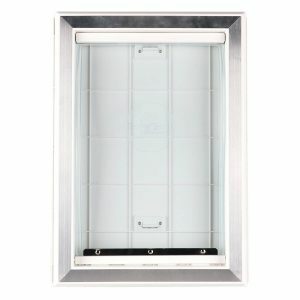 It comes with the easy-to-use locking clear acrylic security panel for the better safety and protection. It gives freedom to your dog for the most comfortable come and go from their separate dog door. 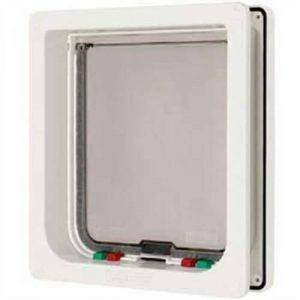 It can provide a perfect magnetic seal around the pet door to avoid any drafts. This seal is independently tested and verified. Even the frame is made of the best-insulated PVC to protect the house and even the dog door from any climatic conditions. This dog door is supremely easy to install. You don’t need any helper to install it as even you can do it all by yourself. Moreover, this door can be the best weatherproof dog door comes within this range. So, don’t wait much and buy it for your furry friend. So, that’s all from my side. These are top 7 weatherproof pet doors available on the market. Maybe you will also find one for your cute little companion from these wonderful options, which can fulfill all his needs. The electronic dog door is becoming a necessity nowadays. Find one and install one for the better safety of your pooch and keep him free! It could be the best gift for him. I hope you found this article informative and useful. And yes, all the very best for the installations. Enjoy shopping.